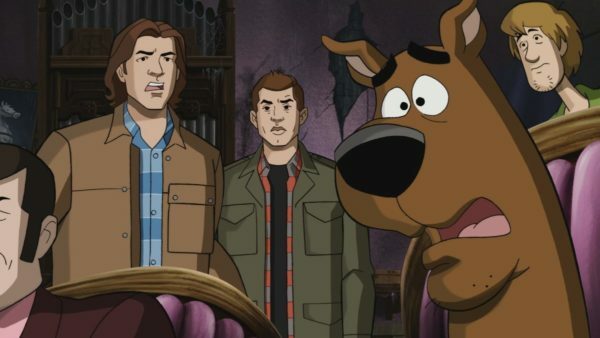 Scooby Doo meets Supernatural! I’ve been waiting for this one for a while now and it more than lived up to its hype — cartoon Winchesters, breaking all kinds of family-fun realities, and fighting a real ghost in the midst of a world that doesn’t believe in them. Fun times for all! We start off the episode with a weird encounter in and of itself. The boys are fighting a plushie dinosaur who sparkles and explodes once Dean torches him. Very odd indeed. But the pawn shop owner where the encounter happened was more than happy to reward their efforts with anything they desired in the store, hence the reason Dean got to add a big-screen television to his man-cave. But, perhaps that was a gift they shouldn’t have taken, considering the fate that befalls the boys when Dean flips the set on. Off to cartoon world they go! After the inevitable freak-out over being cartoons, they head to the malt shop and find the Mystery Machine parked there. Awesome! Dean is definitely in kid-heaven, even more so because of his crush on Daphne. He’s determined to get with that. A bit creepy, but all in good fun. Sam, meanwhile, is not having as much fun, but he puts up with the weirdness for the sake of his brother. Plus, the Scooby Gang have a mystery to solve involving some dead colonel who left Scooby a fortune, so they can tag along and help. Five heirs will get equal shares of the one million dollar inheritance if they stay the night in the haunted mansion. 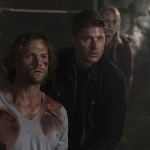 The episode is one that Dean recognizes, so theoretically it might help them. That is, if it doesn’t go off-script. The first heir is really dead and others might be in danger as well. I found it funny that Dean was more concerned that Scooby could die, rather than the fact he or Sam could. 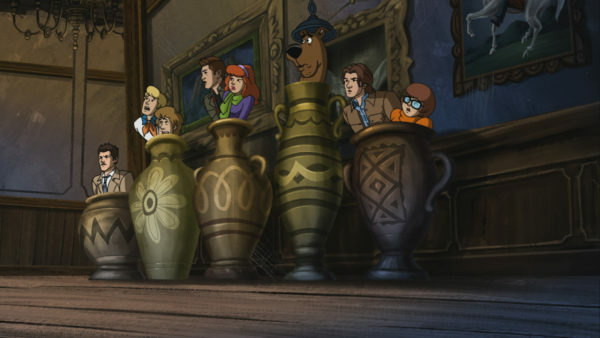 The Winchesters put their life in danger everyday, but Scooby is a national treasure! Also, I was very amused that Velma was protesting against Sam so much, when in actuality she was really crushing on him and his broad shoulders. 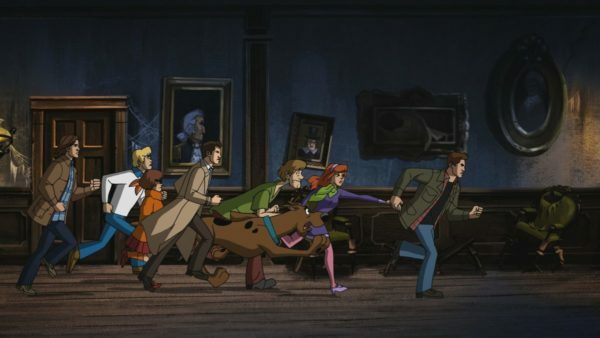 Upon Cas’s arrival, the gang’s all there, and a clue has arisen about what’s really going on. 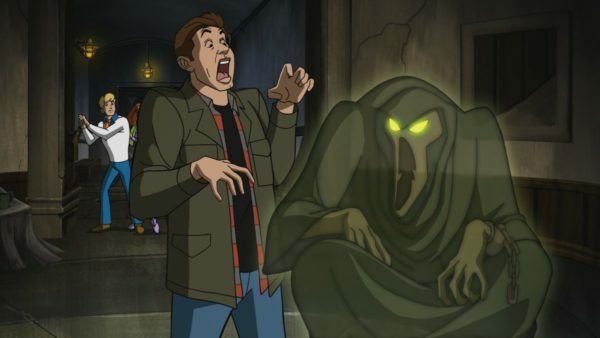 Cas saw purple sparks before getting sucked into cartoon-land, the same sparkles that the boys saw with the plushie dino and the same sparkles the ghost is emitting when he goes through the walls. It’s all connected! The body count is rising, this time with a dismembered heir, and it’s becoming unclear what will happen to them before this is all over. 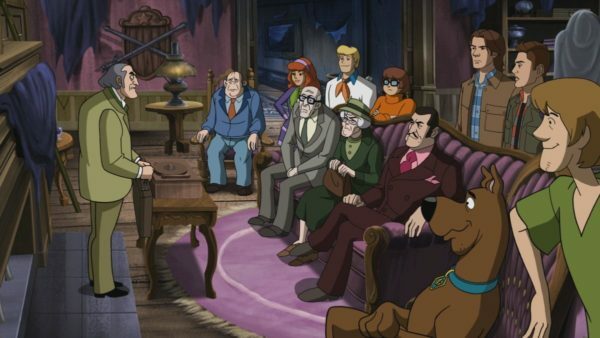 Especially considering the fact that the Scooby Gang doesn’t believe ghosts are real in the first place. 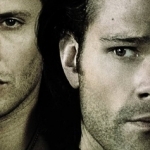 It might be all up to the Winchesters to solve this mystery. 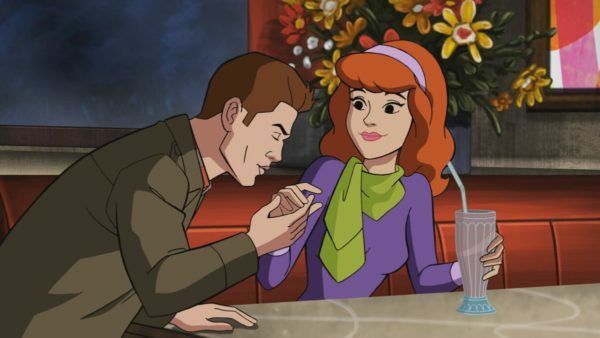 We got a lot of prime cartoon action in this episode, between Dean’s wide mouth when eating the sandwich at the diner to the full gang being involved in the chase scene. So funny! And Dean even finds a secret passage in the library when he pulls a book on the shelf, which is an item that will serve them well later. But first they must contend with a ghost who is getting vicious. He tosses Fred across the room and Shaggy out the window, eventually leading to a fall and a broken arm. And the ghost lifts the girls up in the air, scaring them all, before Dean manages to hit him with a candlestick and disperse the spirit temporarily. It’s time to tell the Scooby Gang the truth about everything, even if they have a nervous breakdown when they realize ghosts and supernatural beings are real. In the end, after a Plan A failure and a Plan B success involving the library’s trap door and a salt circle, the Winchesters find out that the ghost is just a child. He’s being forced to do all these evil deeds by the “bad man” Jay, who is the guy Dean and Sam met in the pawn shop — a man who owns half the town and wants to own all of it. But before they can get back to the real world and solve this case once and for all, they must set up a false reveal so the Scoobies think it’s the lawyer in a mask, which is the true ending of the episode. Preserve the innocence of the cartoon world in any way possible. Well, slightly innocent, since Velma managed to kiss Sam before they bid farewell. Sam and his broad shoulders definitely made an impression. Back in reality, the boys make quick work of the case. Dean smashes the television to find the hidden remnants of the kid, Sam torches it to free the kid’s ghost, and they face off with the land owner back at the pawn shop, where he’s trying to acquire that store to add to his long line of real estate holds. In the end, it was a shady real estate developer after all! 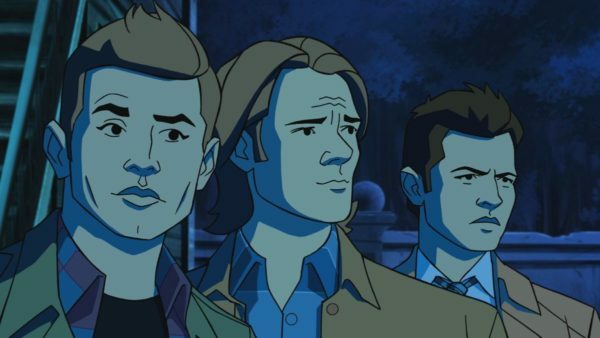 Dean’s over the moon, Cas is confused, and Sam is being as tolerant as possible in the face of his brother’s antics. It’s a good ending to a fun episode. Scooby Dooby Doo!